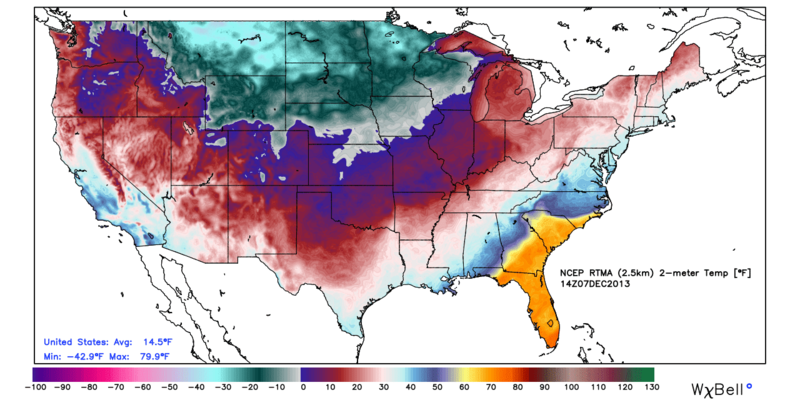 A tongue of cold water exists along the West Coast while the Atlantic remains warmer than normal. 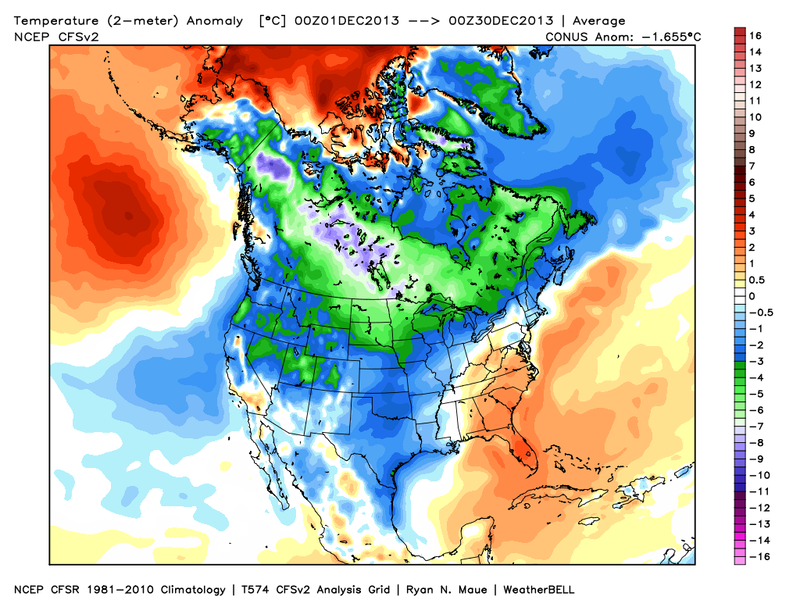 This is consistent with the Cold PDO/Warm AMO ocean regime. The PDO appears to be weaker than normal. This may fire off some snow squalls tomorrow afternoon. 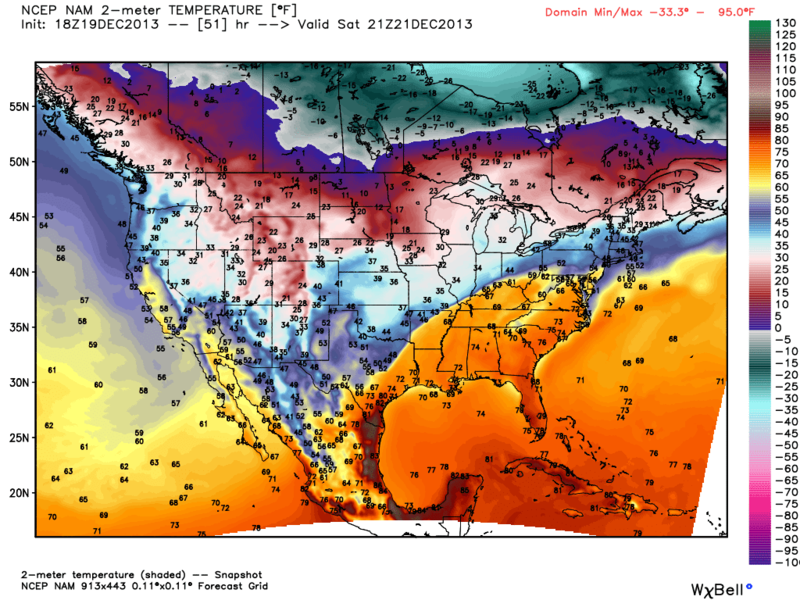 Temperatures tomorrow and New Years Day will be around 20-25 degrees. So lets talk about the storm. 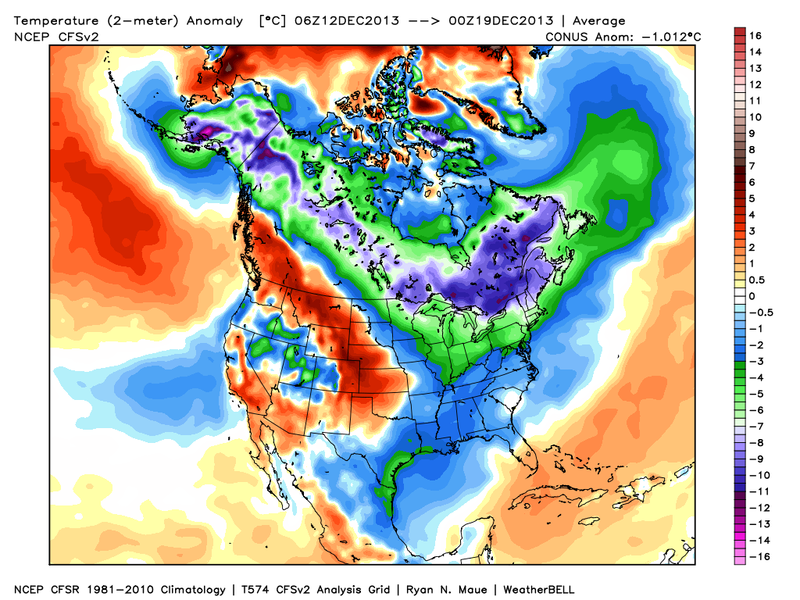 The low in the Ohio Valley will begin to transfer energy off the East Coast. 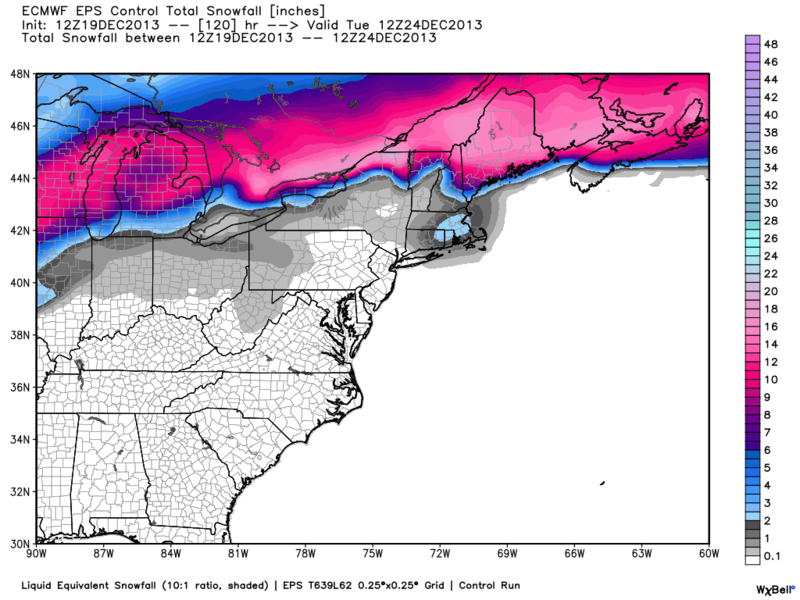 Due to high pressure in an ideal position to the north, snow will break out well in advance of the storm Thursday AM. 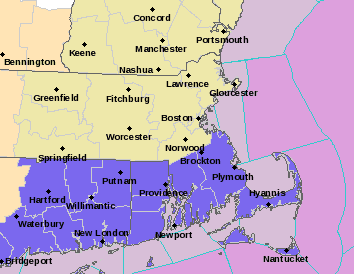 As the storm moves up the coast it will deepen and winds will increase in Southern New England. The snow will be fluffy for everyone except the South Coast/Cape Island. This means snow will pile up and some significant accumulations are possible. Furthermore the winds WILL be a factor with the system. Expect snow drifts. Blizzard like conditions will be possible at times in certain locations. 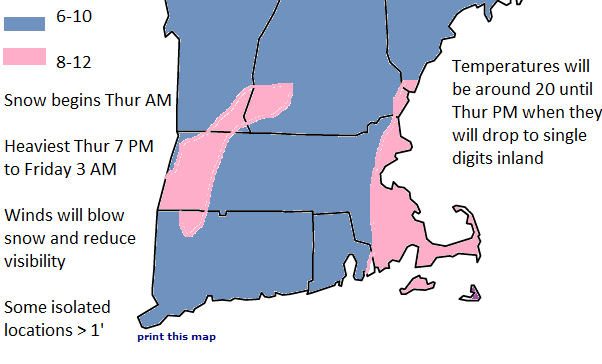 I will make more specific forecasts tomorrow and Wednesday. Grinch Storm Threatens White Christmas; Surprise Xmas Eve? 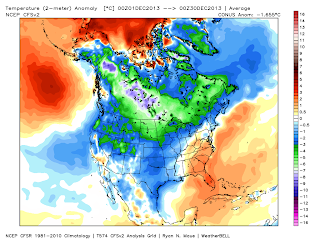 The Grinch and Heat Miser will attempt to ruin a White Christmas in Southern New England. However not all is lost; Snow Miser may have one more trick up his sleeve on Christmas Eve. Do you believe? The melting began today and will continue. Here is the upper level pattern which shows ridging over the east. 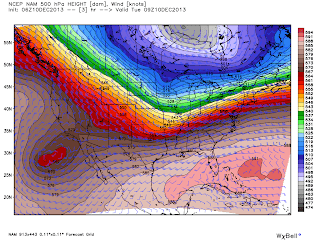 When we are in a ridge the atmospheric thickness increases and generally it warms. A storm will develop in the Southwestern US and eject into the Plains. You can see the upper level energy that will drive this storm in So Cal. It will also tap gulf moisture and make quite a mess in the Central US while also producing severe weather in Dixie. No worries for travelers; this will clear the coast late on Monday (few showers possible in South Florida on Christmas Eve). 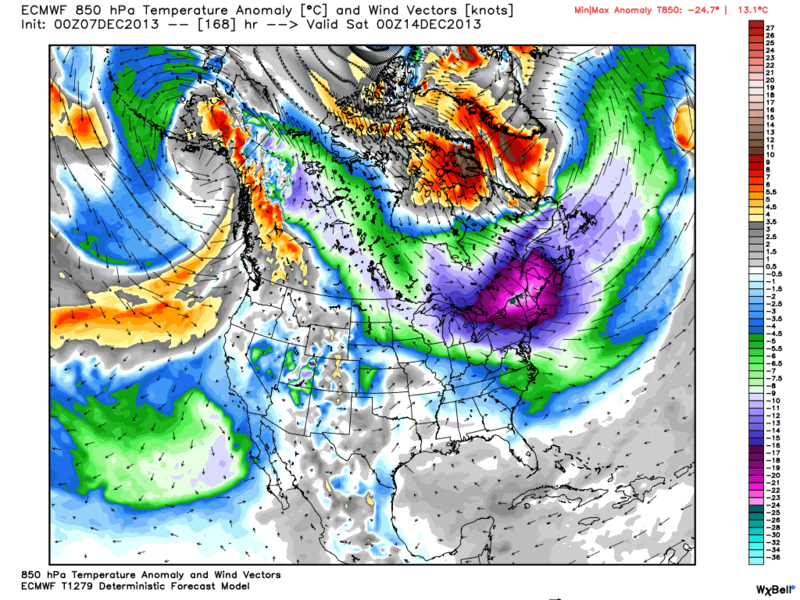 Behind the storm will be a another blast of Arctic air for the Midwest. Not sure how strong this will be in New England at the moment. Temps in New England will be in the upper 40s for most but low 50s looks good in SE MA including Cape and Islands. 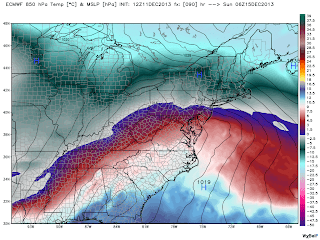 On Sunday the warm front will try to surge into Northern New England. As a few veteran New England meteorologists mentioned this morning (Matt Noyes and Tim Kelley of NECN) good luck. 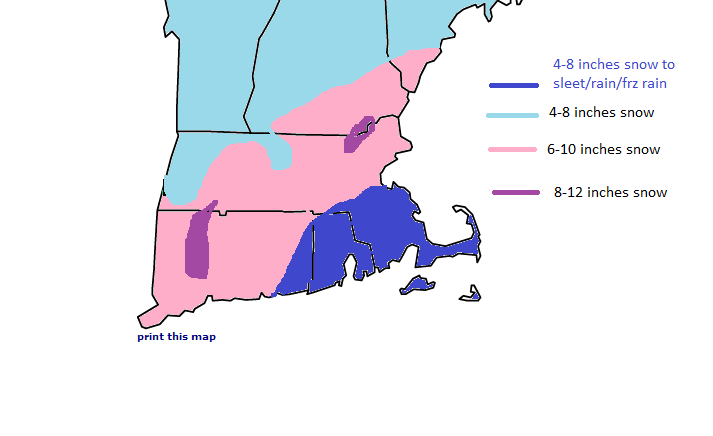 It should get close to Boston and Worcester, if not the MA/NH line. 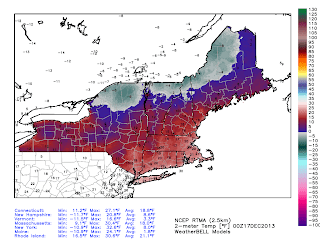 So that means it could be in the upper 50s in Southern New England and around 30 in Portland, ME. 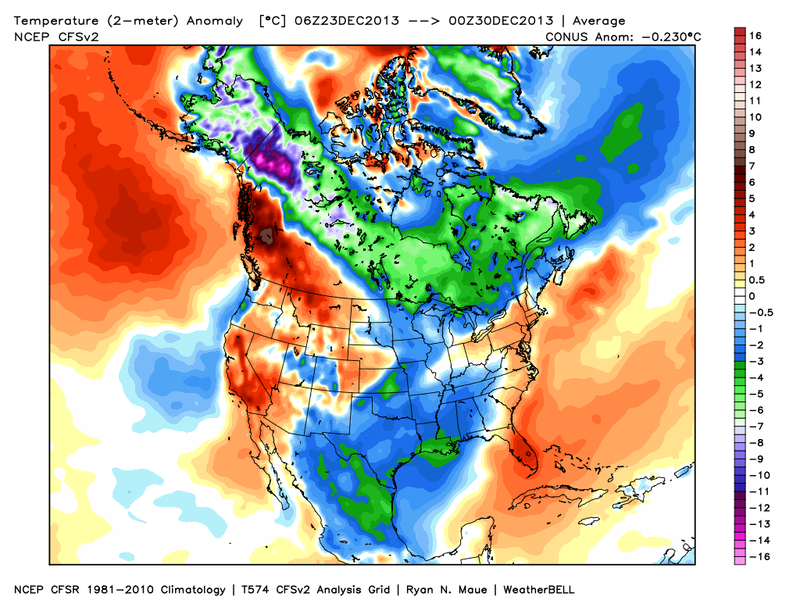 The warmth and rain will hurt the snowpack. But the real snow killer is fog. Expect fog throughout the weekend as the warm front moves over the snow. Anyways on Monday temps will be around 50 as a cold front pushes through. Tuesday is interesting. It will be back to winter with temps around 30. Also a wave of low pressure will likely develop along the front and move northeast. It will probably get close enough to New England to drop a few inches of snow. There is model support but its not a slam dunk. My gut says YES SNOW. 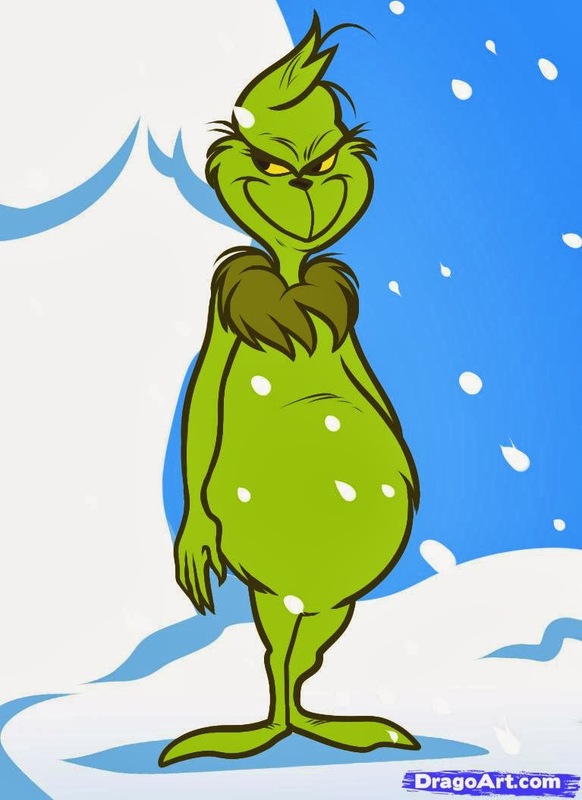 So Heat Miser will try to land a mean uppercut this weekend and ensure a Green Christmas. Will Snow Miser have the last laugh? From "The Year Without A Santa Claus". Not my video, all credit to who owns it. Temperatures tonight will drop near 0. The storm approaches SW CT by 9 AM. Will take some time for the air to saturate due low temps/dew points. 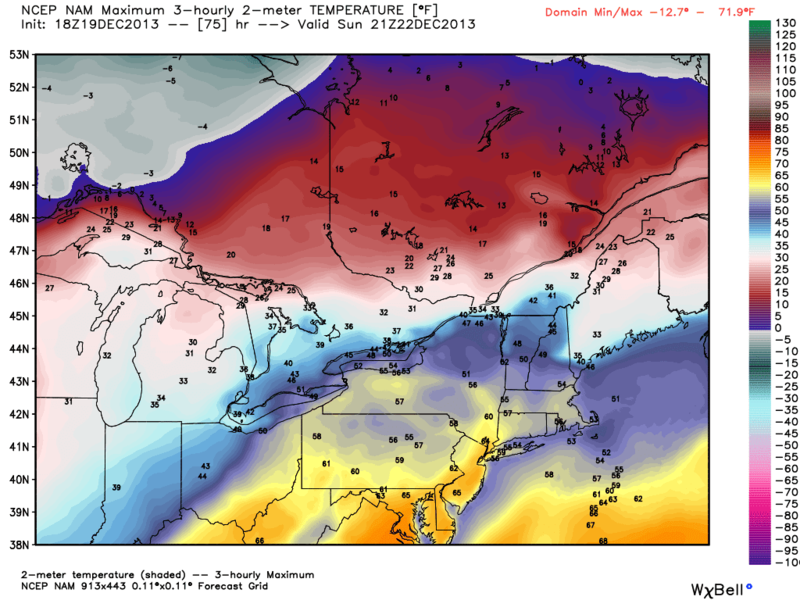 Temperatures tomorrow west of 495 and North of the the Prov-Boston line should stay in the low 20's. 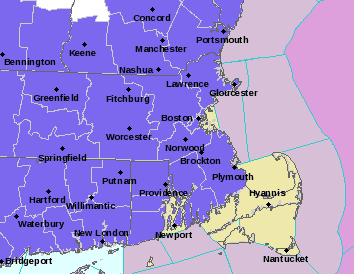 SE MA will warm up to near freezing while the Cape will go above freezing and change to rain. This is not a major event by any means. The trouble lies in the timing. During these systems strong bands of snow can develop that drop 1-3 inches an hour. That is difficult to drive in when caught on the highway. It may only last a few minutes or it could sit an dump. Therefore plan on a long commute tomorrow evening. I'll update in the AM. 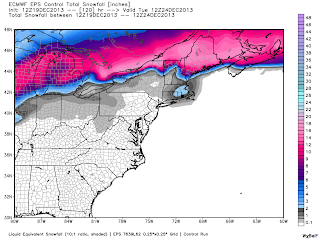 A clipper system will impact the Northeast tomorrow. It will be a quick burst of snow between 11 am - 7 pm tomorrow. Temperatures will be very cold in the interior so expect a powdery snow. 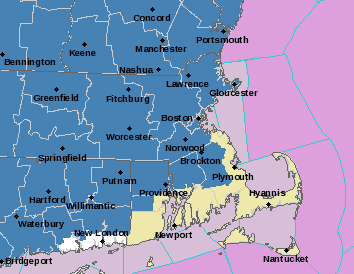 The National Weather Service in Taunton, MA has issued a Winter Storm Watch for portions of Southern New England. The watch will likely be upgraded to a warning tonight. In general 6-12 inches of snow will fall. 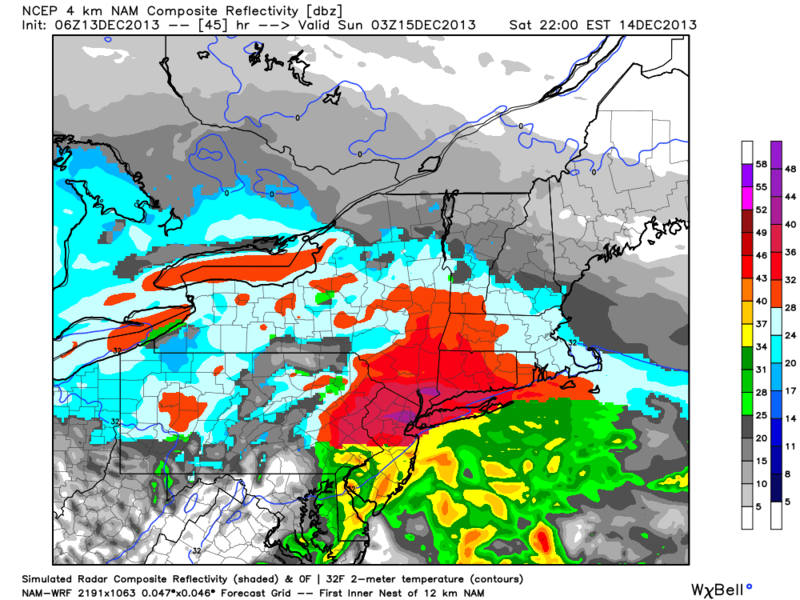 Some areas will switch over to mix/freezing rain/rain Sunday morning. North of the Pike and west of 95 its all snow. An Arctic front will push across New England today. A cold high pressure system will be placed to our North. 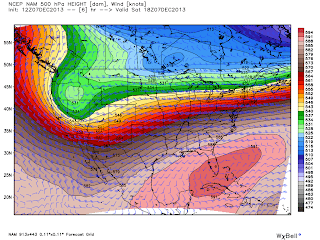 Meanwhile a wave will develop in the Southern portion of the Jet Stream and track towards the Northeast. Here is the storm moving through Texas, being driven by an upper level low in the Southwest. Today will be partly cloudy with high temps 20-25. Tonight temps drop to around 10 degrees. 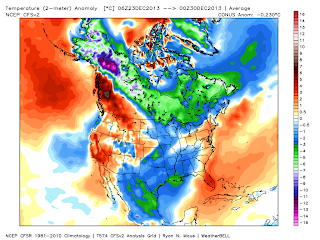 There is not much of a rebound on Saturday as high temperatures will be in the mid teens. Snow will hold off until Saturday evening, though a few flurries or light snow showers will be possible during the day Saturday. The main batch of precipitation arrives after 7 PM tomorrow night. WPC Day 2 Snow Probs Snow > 4"
WPC Day 2 Snow Probs > 8"
If the track is a bit further offshore the 8-12 will expand and push closer to the coast. I don't like to update but I will tomorrow morning if need be. Have a good one. You may have heard about a winter storm potentially impacting Southern New England this weekend. 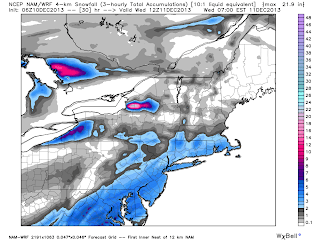 A plowable snowfall is likely for many. Here's a breakdown with my thoughts. I'll have more as confidence increases. Right now I'm curious as to how much snow will fall during the day Saturday. This is NOT a repeat of February. 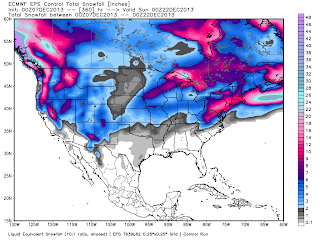 But it could be a decent December storm. 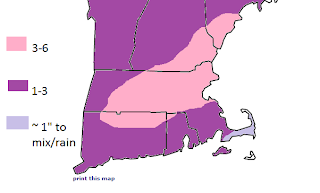 Precipitation will break out in New England (starting in SW CT) between 9-11 am this morning. Am expecting all snow. 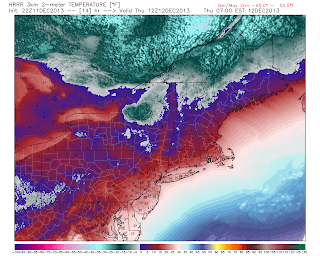 Here are 850 temps at 10 am (850 is located in the snow growth zone. Generally a good approximation of where the rain snow line will be). Surface temperatures will be around 30. There are signals that a moderate band of snow will set up somewhere in SNE. Odds favor this developing along the Southern Coast of Bristol County in MA. The heaviest snow will fall between 11-4 PM today. 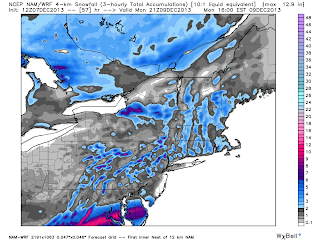 Total snow...I am using the NAM hires for accumulations as it seems to have the best handle on this system. Several points about this image. The snow should be fluffy as one gets near the pike. So we could be looking at higher amounts, but less liquid content. 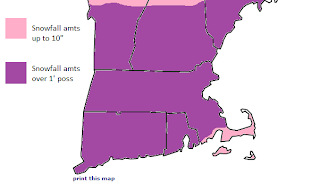 Second I do think someone approaches 6 inches in Southern New England. These are the snow storms that deliver surprises one way or another. Should impact the afternoon commute from school and work so allow some extra time. 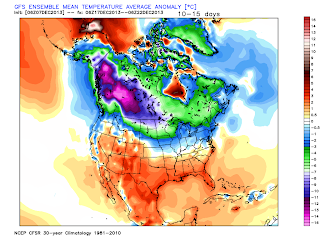 It looks cold for the rest of the week and there is potential for a storm this weekend. More on that later, have a good one. Will there be a white Christmas? Will it snow Monday? I've heard the questions, now let me provide some answers. I took blogging off during football season. Thankfully it was an awesome fall weather wise. We were dry and warm most of the time. That is boring for meteorologists but wonderful for football and those who make a living working outside. 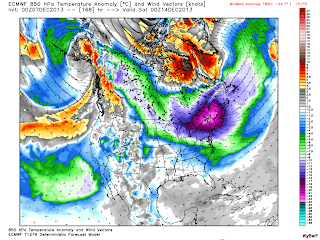 A strong Arctic airmass has invaded the Western portions of the US. Temperatures as of 9 am were below 0 in most of Iowa, Minnesota, North & South Dakota, Montana, and Wyoming. This air mass will moderate as it moves east, but this is impressive early season cold. See the strong high pressure system on the surface chart. Also notice the front draped across the Southeast US. See the temperature contrast? A weak area of low pressure will develop near the Gulf coast and track towards New England. Sunny and 38. Winds out of the northwest 7-12 mph. Clear skies. Temps 17-22. Light west winds 2-5 mph. Precipitation breaks out around 3 am. Starts as snow, will slowly change to ice and plain rain. Snowfall accumulations dusting to 2 inches (isolated 3). Additional rain/ice less than 0.25 inches. Not a big deal, just give yourself an extra hour or two. This system looked more impressive a few days ago. I don't believe there will be any school cancellations in Southern New England. Temperatures will not get out of the 30's. 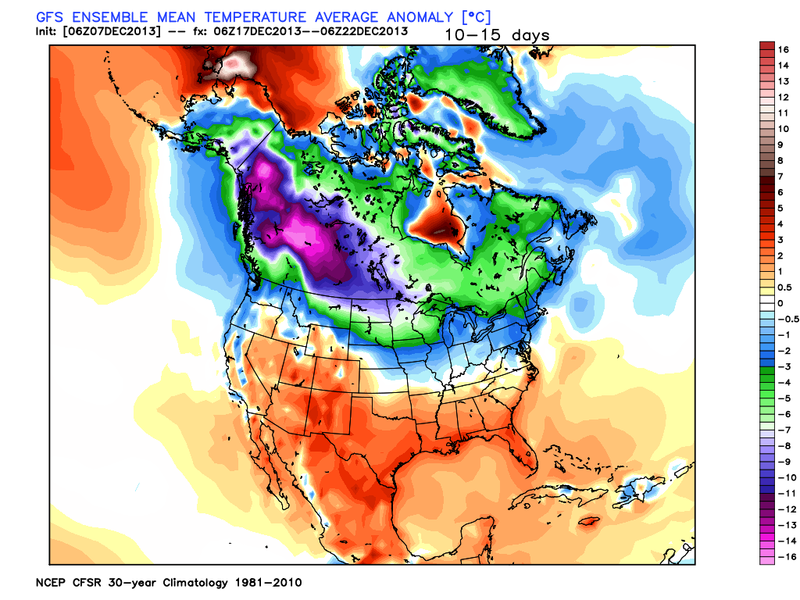 My prediction- a white Christmas and the ice will be safe enough to skate/ice fish by the 25th. Another update tomorrow/Monday. Have a good weekend.